Speer introduced the bonded jacketed hollow point projectile. Since then it has become one of the great innovations in handgun personal protection ammunition of the past several decades. 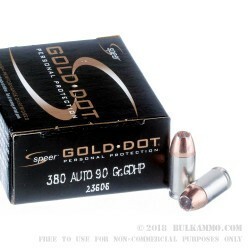 This is a .380 ACP/Auto load that offer that bonded jacketed hollow point projectile in the form of the proven Gold-Dot line from Speer. The bullet is a 90 grain jacketed HP with a nice level of static ballistic performance. The very respectable 900 feet per second and 196 ft. lbs. of energy is enough to stop threats of all types. The penetration and core weight retention abilities of this branded projectile offers a clear benefit over most other .380 loads. This is a cartridge that features nickel plated brass and a Boxer primer making it a premium reloading cartridge for those who are committed to the platform. Speer holds a huge amount of law enforcement cartridge contracts each year. Their resulting insight and market leverage helps them to lean towards the more innovative side of things and gives them a unique perspective for production of personal defense, range/target and duty ammunition. This ammunition is generally well behaved in otherwise hard to feed .380 ACP/Auto firearms. 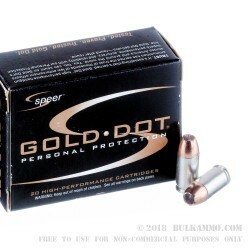 A: This Speer Gold Dot ammo will feed reliably in a wide variety of pistols. We have not experienced feeding issues with it in any .380 handgun. .380 ACP (9mm Short, 9mm Browning, 9x17mm) is not the same as 9mm Luger (9mm NATO, 9mm Parabellum, 9x19mm). 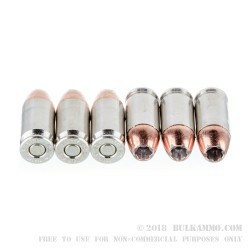 The bullet diameter is almost exactly the same, but the cartridge cases have a 2mm difference in length. Also, the case head diameter is different, and the method by which each cartridge headspaces is different. 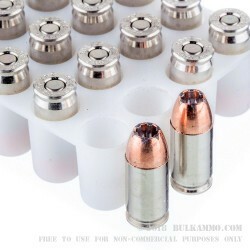 9mm ammo is loaded to much higher pressures, as well. It is impossible to chamber 9mm ammo in a .380; the reverse is possible, but not advisable.